Michael Franti is a passionate man. His primary joy, as his devoted fanbase can attest, is making music, with a genre-spanning discography -- recorded primarily with his current group, Spearhead -- spanning 30 years. There's also his yoga practice, his commitment to living vegan and barefoot, his nonprofits, his San Francisco hometown, his wife and kids and the other causes dear to him that he mentions to USA TODAY before jumping on a plane to the Sundance Film Festival. Franti is hosting a screening of his new "Stay Human" documentary, his second self-directed work behind 2005's "I Know I'm Not Alone," and describes the new film as the story of his life's journeys, presented as "a personal battle between optimism and cynicism." 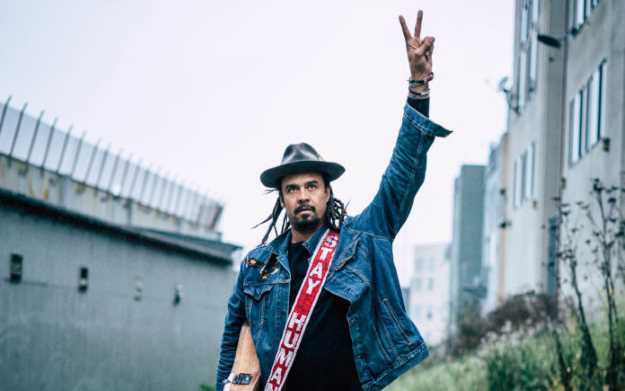 The "Stay Human" film has been the closest thing to a singular cause for Franti over the last year -- if you also count his accompanying "Stay Human Vol. II" album, recorded with an array of collaborators including Ben Simonetti (Zac Brown Band, Shemekia Copeland, Blake Shelton), Don Corleon (Rihanna, Migos) and Ross Golan (Lady Antebellum, Ariana Grande, Nicki Minaj), because a guy like Franti isn't just working on one project at once. Franti's "Stay Human" documentary and "Stay Human Vol. II" album are both available Jan. 25. For Franti, embarking on a few months of "Stay Human" screenings and performances wasn't just getting exposure for the film. He wanted to make sure he could provide fans with a more engaging experience than they could find on their couches. "My wife and I, we love Netflix," he said. "And we'll get a tub of ice cream, and we get a laptop in bed, and set it all up perfectly. And then after 10 minutes, we usually finish the ice cream and roll over and fall asleep, and we miss the movie. So I thought, rather than people experiencing the movie that way, it would be great for them to experience it with a thousand other viewers in a room and be able to feel the emotional roller coaster ride." The anecdote says a lot about how Franti sees his purpose in the world. He's an artist who's clearly interested in making deep connections with listeners, speaking powerfully through his music and living by his mantra that "there is no one in the world that you wouldn't love if you knew their story." Those impulses informed "The Flower," Franti's new song with an anti-gun violence message, with Franti later traveling around the country to meet families impacted by tragic shootings for the song's music video. Franti explained that, like many of his songs, "The Flower" has a deeply personal backstory, based on a harrowing brush with tragedy. "I live in a neighborhood in San Francisco called Hunters Point, where there's a lot of gun violence," he said. "And about four years ago, we had a bullet come through the wall of my teenage son's bedroom and go through the room, through another wall, and up in our living room. And, fortunately, we were away at the time that happened, but it was really a wake-up call for me. And I started really thinking about, 'What if the worst-case scenario would've happened in that moment?" "And so going and meeting families all around the country (for "The Flower" video) who have had that worst-case scenario happen to them, hearing those stories and having them really be vulnerable and break down in front of me and talk about their family members, on one hand, I felt really honored that they would be trusting to speak and explain it to me," he continued. "But each person I talked to, I felt like I was reliving their stories, and I really wanted to make a video and show how this issue is affecting every one of us in America. "Maybe there was a time where you could say, 'Oh, it's just those people over there, and this issue doesn't really affect me.' But now, almost every school in America has a day where they do active-shooter trainings. And seeing the Route 91 concert, you think like, 'At a country music concert, (these shootings) could never happen. They're the nicest people on the planet, how could this happen?' But it did." Franti admits that an incident like the Las Vegas concert shooting on Oct. 1, 2017, which left 58 people dead and over 500 wounded, is a serious concern for him, considering the 200+ concerts he has played over the last three years. "I remember when that shooting happened, I had just played at a festival in Arizona," he said. "I walked off the stage, and there was 10,000 people who just were having fun, singing and dancing and jumping up and down and eating food and drinking beer, and having the greatest time ever. And I went on the tour bus, and I saw the news come across about the shooting, and I thought to myself how I had played that scenario in my head many times before." And yet, as he explains, he's also come to understand that his listeners don't always want songs with weighty messages -- that sometimes, they just want to sing and dance, and remember themselves and their loved ones in happier times. "I was invited to play in a prison in the late '90s, and I started singing songs about the prison industry, how it was incarcerating people and destroying lives for petty drug offenses, all those songs," he said. "And at the end of it, this guy came up to me and goes, 'You know, Michael, I'm here for life. And I haven't heard live music in a long time, and I don't know if I'll ever hear live music again. But I would have really loved to hear a song about how you miss your girlfriend or how great it is to be in the kitchen with your family on Thanksgiving Day.' And that day happened to be Thanksgiving Day. So it really made me think about music in a different way." Franti cited another formative experience that taught him that singing about the personal, rather than the political, can be an equally effective way of forging those deep connections with fans that he seeks out. "Another time, I went to Iraq in 2004, 11 months after the war started, I played music on the streets for Iraqi civilians and U.S. soldiers. And I went to this Iraqi family's house, and they took me into their basement where they hid during the bombing, and I sang the song with the lyrics, 'We can bomb the world to pieces, but we can't bomb it into peace. And I thought they would really connect with it. "Then afterwards, the father of the family said, 'How dare you sing us a song like this while your country is bombing us?'" Franti continued. "And he said, 'What we really want is for you to sing songs that make us laugh and dance and sing and cry and express our emotions that are so bottled up right now.' And it made me think that music can work in different ways, and that it's important for me as an artist to try to express the full rainbow of human emotions."